With SHELFSTORE’s shelving system and range home storage ideas, you can make the most of you’re the space available in your home. Get the most of your box room. Turn your child’s bedroom into their very own den, or simply get organised with one of our custom home office designs. 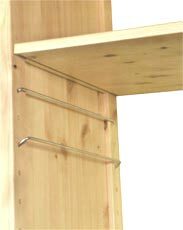 Whether you’re looking for simple pine shelving, bookcases or cabinets, or have something more unique in mind, one of SHELFSTORE adjustable shelving systems is sure to meet your needs in style. SHELFSTORE’s shelves are the ideal children’s’ storage system. What makes our system the ideal kids' bedroom shelving? Besides its shear strength our shelving is incredibly versatile which allows you to continually rearrange the components as your child’s needs change and their toy and book collections grows and changes.